After 1770, Ireland experienced the establishment of modern forms of Irish Catholicism, new engagement by the public with the political process, and the growth of the modern state, represented by new legal and educational systems. 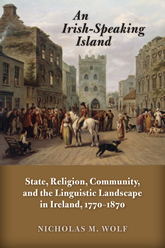 An Irish-Speaking Island investigates the role in these developments of the population who spoke Irish in their daily lives—whether as a first or second language—and links the history of language contact and bilingualism with the broader history of Ireland in the eighteenth and nineteenth centuries. As late as 1840, Ireland had as many as four million Irish speakers—a significant proportion of the total population—who could be found in every county of the island and in all social classes and religious persuasions. Their impact on the modern history of Ireland and the United Kingdom cannot be captured by a simple conclusion that they became anglicized. Rather, Nicholas M. Wolf explores the complex ways in which the transition from Irish to English placed a premium on adaptive bilingualism and shaped beliefs and behavior in the domestic sphere, religious life, and oral culture within the community. An Irish-Speaking Island will interest not only historians but also scholars of linguistics, folklore, politics, literature, and religion.